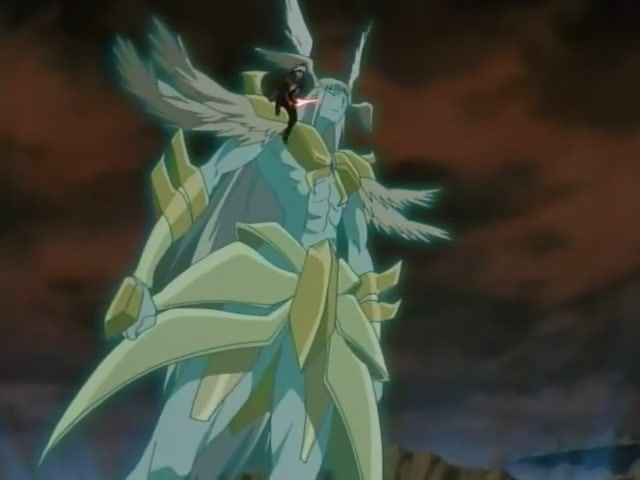 This is a 'summon' anime where a boy summons or casts a monster in the form of a human (but big like 3-5 meters tall). The monster is a legendary creature and is blue or green. His eyes are closed and he has two horns and has long hair. I can't recall if he possesses a weapon. There are many monsters but there are only 6 or 9 "Legendary" creatures. Two of these are yellow and pink and they fight each other or together. That's probably Kiba, which premiered in 2006. In a dystopian future, two friends dream of freedom... and gain more than they bargain for! Hothead Zed is on the run from the authorities, while his brainy pal Noah struggles with his own battered body. Both find a magical world that seems to offer escape and power undreamed of. Join Zed and his powerful, rebellious spirit Amir Gaul on their search for the ultimate power. It's a force that can save the world—or destroy life as we know it. This is the world of KIBA! Where you must harness the power within and fight with all you got! A boy summons or casts a monster in the form of a human (but big like 3-5 meters tall). Meet Zed and Amil Gaoul, his summoned creature of choice. As you can see, Amil Gaoul is quite big (Zed can sit on his shoulder), and seems to vary in size throughout the summonings. Amil Gaoul is indeed blue-green/turquoise. 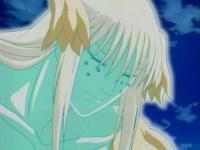 In his "first form", he keeps his eyes shut, only to open them in his final form. He has long hair and two... things... on his head (also seen in the picture above). I'm not sure what they're supposed to be. There are six "Key Spirits", Amil Gaoul being the strongest of them all. Shadin is a yellow Key Spirit, and Pronimo is a pink Key Spirit. I don't know whether they interact (but it's likely, as they're "Key Spirits"). I found it after having identified it on another question, namely Anime where they summon monsters using crystal balls attached into their body parts.